Another apiculture-flavoured tale of daylight robbery, literally, to follow the post on hive and bee thefts last week. However, this time it’s not dodgy bee-suited perps with badly inked prison tats offering cheap nucs down the Dog and Duck. 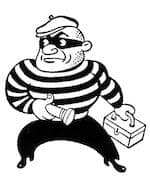 Like other offenders, the robbers this week wear striped apparel, but this time it’s dark brown and tan, or brown and yellow or black and yellow. I am of course referring to honey bees and wasps (Vespa vulgaris and V. germanica), both of which can cause major problems at this time of year by robbing weak colonies. The season here – other than for those who have taken colonies to the heather – is drawing to a close. The main nectar sources have more or less dried up in the last fortnight. There’s a bit of rosebay willow herb and bramble in the hedgerows and some himalayan balsam in the river valleys, but that’s about it. Colonies are strong, or should be. With the dearth of nectar in the fields, the foragers turn their attention to other colonies as a potential source of carbohydrates. Colonies need large amounts of stores to get through the winter and evolution has selected a behavioural strategy – robbing of weaker colonies – to get as much carbohydrate from the easiest possible sources. At the same time, wasps are also wanting to pile in the carbs before winter 1. In the last fortnight the wasp numbers in my apiaries and equipment stores have increased significantly. Within a few days in late summer/early autumn the mood and attitude of colonies in the apiary changes completely. During a strong nectar flow the bees single-mindedly pile in the stores. They alight, tail-heavy, on the landing board, enter the hive, unload and set out again. There’s a glut and they ignore almost anything other than bingeing on it. Inspections are easy. Most bees are out foraging and they are – or should be – well-tempered and forgiving. But then the nectar flow, almost overnight, stops. 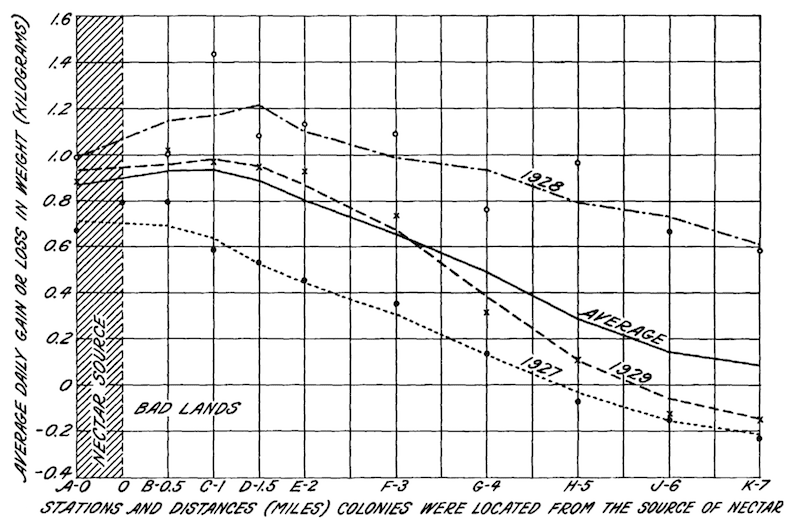 Colonies become markedly more defensive. They are packed with bees and they’re tetchy. There’s nothing to distract them, they resent the intrusion and they want to protect their hard-won stores 2. At the same time, they quickly become more inquisitive, investigating any potential new source of sugar. If you shake the bees off a frame and leave it standing against the leg of the hive stand there will be dozens of foragers – many from nearby colonies – gorging themselves on the nectar. If you spill unripened nectar from a frame they’re all over it, quickly forming a frenzied mass – probably from several different hives – scrabbling to ‘fill their boots’. They also closely investigate anything that smells of nectar or honey. Stacks of equipment, empty supers, hive tools, the smoker bellows … anything. And it’s this behaviour that can quickly turn into robbing. The foragers investigate a small, dark entrance that smells of honey … like a nuc in the corner of the apiary. They enter unchallenged or after a little argy-bargy 3, find the stores, stuff themselves, go back to their colony and then return mob-handed. Before long, the nuc entrance had a writhing mass of bees trying to get in, any guards present are soon overwhelmed and, in just a few hours, it’s robbed out and probably doomed. This is the most obvious – and rather distressing – form of robbing. Wasps can do almost exactly the same thing, with similarly devastating consequences. Once started (and obvious), robbing is difficult to stop. About the only option is to seal the target hive and remove it to another apiary a good distance away. Far better to prevent it happening in the first place. The best way of preventing robbing is to maintain large, strong and healthy colonies. With ample bees there are ample guards and the colony will be able to defend itself from both bees and wasps. Strong colonies are much more likely to be the robbers than the robbed. For smaller colonies in a full-sized hive, or nucleus colonies or – and these are the most difficult of all to defend – mini-nucs used for queen mating, it’s imperative to make the hive easy to defend and minimise attracting robbers to the apiary in the first place. The underfloor entrances on kewl floors are much easier to defend than a standard entrance and small entrances are easier to defend than large ones. ‘Small’ might mean as little as one bee-width … i.e. only traversable by a single bee at a time. You can even combine the two; insert a 9mm thick piece of stripwood into the Kewl floor entrance to reduce the space to be defended to a centimetre or two. If – as happened tonight when returning wet supers to the hives – I don’t have a suitable piece of stripwood in the apiary I use a strip of gaffer tape to reduce the entrance 4. Gaffer tape is also essential to maintain the integrity of the hive if some of the supers are a bit warped. 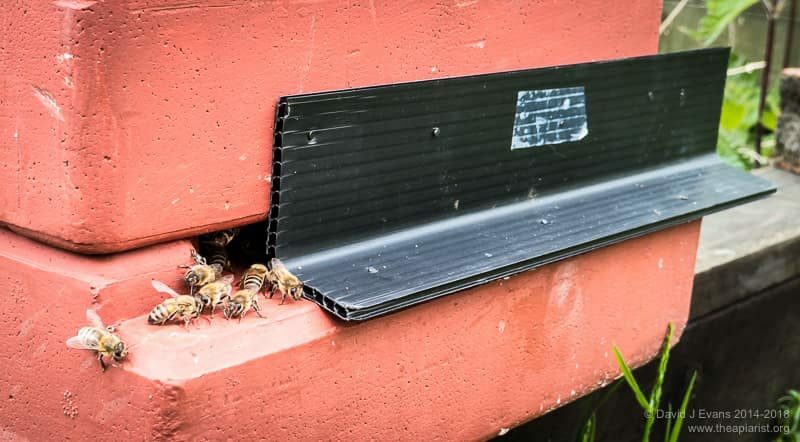 Wasps can squeeze through smaller holes than bees and the quick application of a half metre along the junction between boxes can save the day 5. The poly nucs I favour have a ridiculously large entrance which I reduce by 90% using foam blocks, dried grass, gaffer tape, wire mesh or Correx. 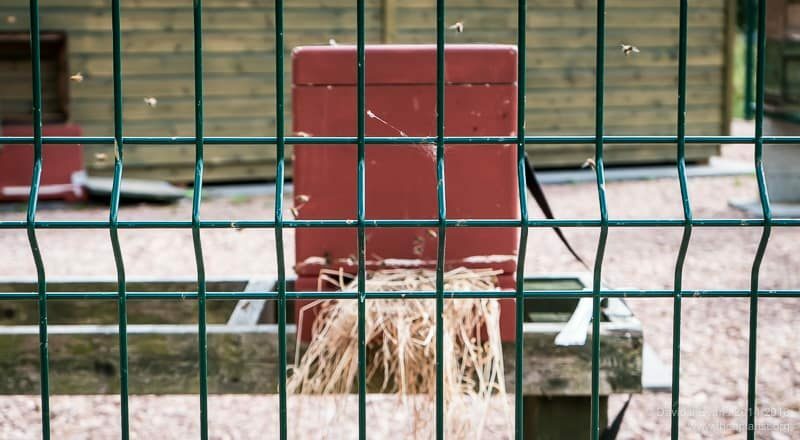 Finally, reduce the inducement robbers – whether bees or wasps – have to investigate everything in the apiary by not leaving open sources of nectar, not spilling honey or syrup, clearing up brace comb and ensuring any stored equipment is ‘bee proof’. You don’t need to inspect as frequently at this time of the season. The queen will have reduced her laying rate and colonies are no longer expanding. With no nectar coming in they should have sufficient space in the brood nest. There’s little chance they will swarm. If you don’t need to inspect, then don’t. The ability to judge this comes with experience. If you do have to inspect (to find, mark and clip a late-season mated queen for example 6 do not leave the colony open for longer than necessary. Any supers that are temporarily removed should be secured so bees and wasps cannot access them. 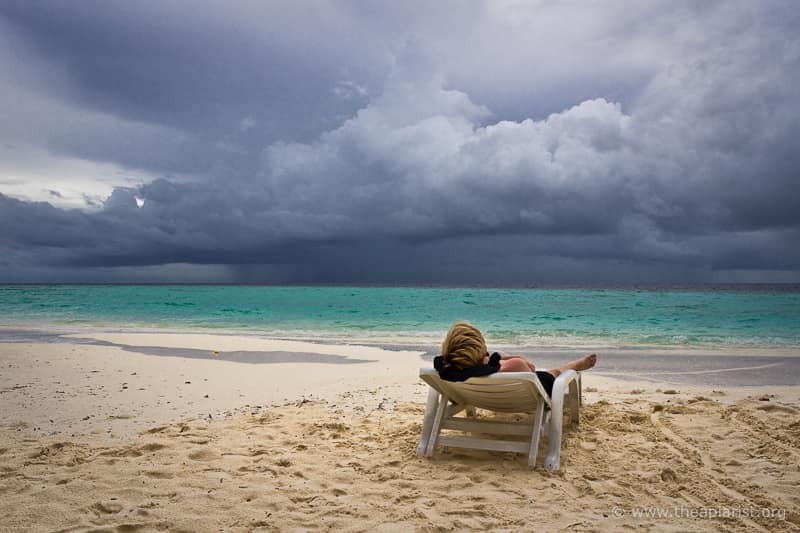 If you’re returning wet supers after extraction, do it with the minimum disruption late in the evening. These supers absolutely reek of honey and attract robbers from far and wide. Keep the supers covered – top and bottom – gently lift the crownboard, give them a tiny puff of smoke, place the supers on top, replace the roof and leave them be. In my experience wet supers are the most likely thing to trigger a robbing frenzy. I usually reduce the entrance at the same time I put the wet supers back and try to add wet supers to all the colonies in the apiary on the same evening 7. I generally don’t inspect colonies until the supers are cleaned out and ready for storage. 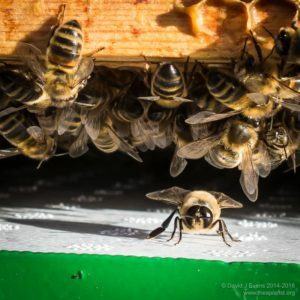 This entry was posted in Beekeeping, Behaviour, Drifting and robbing, Security, Wasps and tagged autumn, robbing, weak colonies on August 3, 2018 by David. There’s something both vaguely amusing and deeply repellent about hive and bee thefts. Vaguely amusing in terms of the way the press cover it and possibly in the way it’s perceived by the general public. The latter have visions of beesuited ‘rustlers’ rounding up ‘herds’ of bees and making off with them in the dead of night. The press do little to alter this perception, generally stressing the large number of individual bees stolen in articles littered with beekeeping gaffes. The deeply repellent aspect of honey bee thefts is that most must be carried out by beekeepers. Handling bees in large numbers is a daunting prospect for most of the general public. Even the most light-fingered ne’er-do-well is likely to think twice about making off with a 40 litre box packed with stinging insects. It requires specialist knowledge and equipment … or, in their absence, tener cojones as the Spanish say. Bee and hive theft is not like a ned1 stealing a smartphone and flogging it at a car boot sale … it’s more like a surgeon being involved in organ trafficking. Whether to make up for their own beekeeping inadequacies or simply to make a quick profit, this type of ‘inside job’ is an unsavoury reminder that some – hopefully a very few – ‘beekeepers’ have criminal tendencies and cannot be trusted. “Rustler steals 40,000 bees in Britain’s biggest hive heist in years” is a recent headline in The Guardian. The article describes the theft of a single hive (presumably gold-plated as it’s valued at £400, though perhaps this price reflects the fact that it’s the ‘biggest’ hive) from a ‘ditch’ in Anglesey, blaming the recent increase in bee thefts on the spiralling cost of ‘nukes’ (sic). The Daily Mail announces that bee hives are stolen and sold for up to £8,000 a time, and helpfully illustrate the article with a picture of a bumble bee (almost certainly a male) and the caption “Some queen bees are worth £180 …”. I can’t help but think that the emphasis on the ‘value’ encourages some of the thefts. 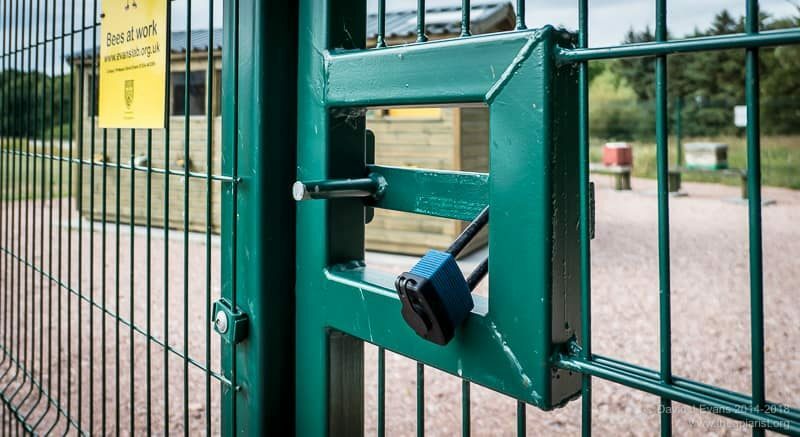 After all, what else valued at £400 (or £8000 for that matter) do you know about that’s left unattended and unlocked for days at a time in a remote corner of a farmer’s field. It’s not really clear from the Daily Mail article (above) whether it was one or many hives that were stolen. 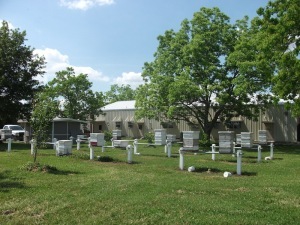 However, since many apiaries will contain multiple hives, it’s not unusual to have the entire lot vanish. Another poorly punned headline from The Telegraph announces “Britain’s biggest bee sting: One million insects stolen from Oxfordshire hives”, choosing to emphasise the total number of insects, rather than the 40 hives that went missing. Pedantically, the hives and the bees were stolen … they didn’t just take the bees, though that happens as well as will soon become clear. But, as with so many other things, you need to go across the Atlantic to experience the biggest bee and hive thefts. The scale of commercial beekeeping operations in the USA means that there’s added incentive and opportunity. Two ‘beekeepers’ were charged in 2017 with the theft of 2,500 hives (no need to count the bees this time, hive numbers alone were sufficiently impressive) worth almost $1M. Hives were stolen from apiaries at night, spirited away on a flatbed trailer and moved to an isolated location where they were repainted. “It looked like a chop shop for bee hives,” Fresno detectives said. The Oxfordshire bee heist was of overwintering hives in a field that “couldn’t be seen from the road”. As I’ve previously discussed, obscurity does not guarantee security. 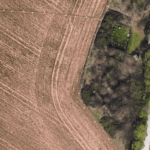 High resolution satellite imagery is increasingly available and it’s easy to find apiaries. While preparing this post I looked at Google and Bing maps of an apiary I know well. 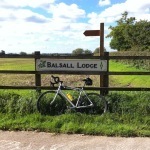 It is effectively invisible from public roads or the adjacent football pitch. The satellite images are taken at different times 2, so aren’t identical. The first two images are at about the same scale. 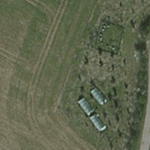 The three white rectangles in the Bing maps image are poly tunnels, each about 5-6 metres long. The regularly-spaced hives are pretty obvious. 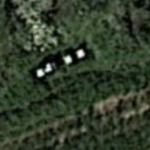 The image on the right is the current enhanced Google maps view, in this individual hives can clearly be counted. You can even discriminate between paving slabs with hives on stands and those that are unoccupied. A beekeeper thief could spend a few winter evening scanning these sorts of satellite images and easily identify likely apiaries, whether they can be seen from the road or not. I’m going to write more extensively in the future about deterring thieves as there’s a more important topic to cover here. You can place hidden cameras near the apiary (to catch a thief … or obvious ones to deter). There are now ways of installing GPS-trackers in hives. These trigger a remote alarm if moved. You can ‘label’ equipment and make it uniquely traceable using SmartWater-like solutions. Or just use an enormous fence and a big padlock. Shook swarms plainly been removed from them. Conducting shook swarms on large double brood colonies is unlikely to be the work of someone with just a rudimentary knowledge of the art. Done properly, it involves first finding and caging the queen, then shaking all the bees off all the frames. It’s hard work and to someone unused to working with lots of bees it would be a daunting undertaking. Pssst … wanna buy a nuc? The SBAi post author suggests that the likely fate for those bees is to be split into nucs and sold on to unsuspecting beekeepers. It’s really a bit late in the season … remember that you should ideally only buy nucs with at least 2-3 frames of brood in all stages from the queen in the box 4. However, beginners desperate for bees who don’t purchase from a known and trusted source are unlikely to be worrying about the quality of the bees they buy. The bad news for the thief is that this apiary has had EFB [European foulbrood] earlier in the summer and is still under a standstill order, and one of the hives shaken was the one next to the (removed and destroyed earlier) EFB case. This must be considered a super high risk bit of theft ………… so if you are offered bees by an unknown source in the area be very very careful. Ironically, great advances have been made recently in molecular fingerprinting of foulbroods to determine transmission pathways. This is similar to the DNA fingerprinting that can unambiguously link a person to the scene of a crime. It should soon be possible to definitively demonstrate the EFB in that dodgy nuc you bought from the bloke in The Crooks Arms public house was from bees stolen from an apiary ‘near Dundee’. That’s a doubly sour note to end on. One or more beekeepers must have been involved and it could result in the further spread of EFB. It’s been a great summer for bees. Many experienced beekeepers will likely have an excess of bees at this time of the season. The usual high demand for nucs in early Spring has probably all been met. However, there will still be people wanting to start beekeeping. It is this group of novices that might end up buying a poorly balanced nuc of stolen bees with a side order of EFB. Buy from a known or trusted source. Ask around. The beekeeping community is pretty small. Most beekeepers and beekeeping associations are very approachable. Inspect the nuc before purchase. If there’s little or no brood, frames with undrawn foundation or an obvious mix of bees then do not buy it. Finally, if you don’t know whether the bees are local, whether the source is trusted or whether the nuc is high quality … stop. Get some training, get a mentor and get some help with the purchase. The title of this post is an obvious bee-flavoured concatenation of a well known insult that “strikes hard at one’s personal integrity and social standing, both, in an economy of words”. The simpler concatenation to B’Stard was used by the late Rik Mayall as the surname of his character (Sir Alan Beresford B’Stard) in The New Statesman, a late-80’s sitcom satirising the then Conservative Party government. B’Stard would stop at nothing to fulfil his megalomaniac ambition. He was “selfish, greedy, dishonest, devious, lecherous, sadistic, self-serving”. It strikes me that most of these terms could also be applied to bee rustlers. This entry was posted in Beekeeping, Security and tagged bee theft, EFB, foulbroods, Rik Mayall, shook swarm on July 27, 2018 by David. 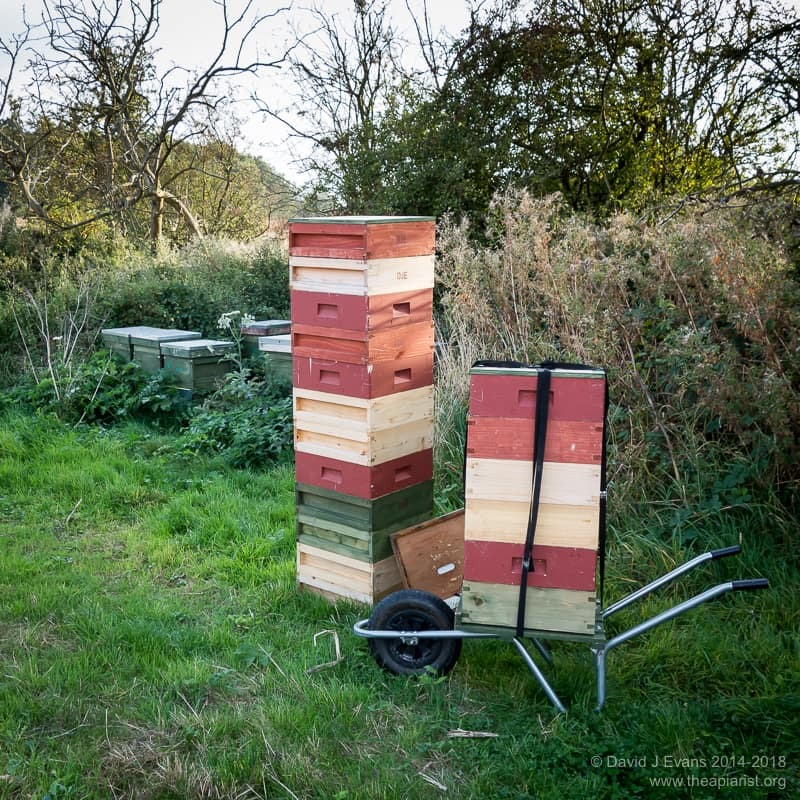 The increased interest in beekeeping over the last few years has meant there is considerable demand for bees, either for beginners or to replace stocks lost over the winter. The impatient and unscrupulous have resorted to bee rustling, either directly or indirectly. It is therefore sensible to take precautions to prevent the theft of your hives and nucs. This subject was covered extensively a couple of years ago in a post on Beekeeper UK which described branding, locks, ground anchors and other deterrents and is recommended reading. However, one aspect of security worth reinforcing is the impact of new digital technology – specifically smartphones and satellite imagery – which can be used to locate hives. Smartphone cameras (and many new digital cameras) embed the GPS coordinates into their images. This information is contained within the exif (an abbreviation for exchangeable image file) data in the image, which also includes details of the camera, exposure etc. This can be readily viewed using online tools such as Jeffrey Friedl’s Exif (Image Metadata) Viewer. 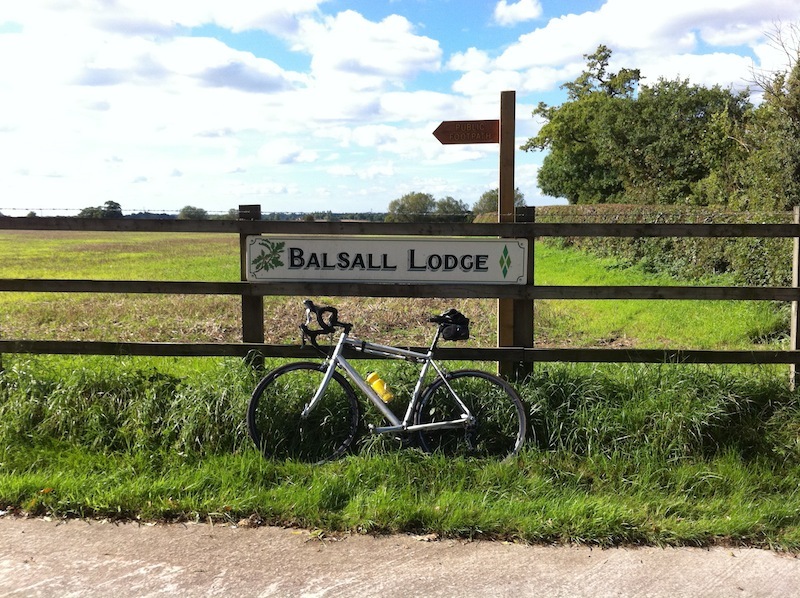 To illustrate this I’ve uploaded an image (right) taken when out cycling – so not compromising my own apiary security – with an iPhone a few years ago. If you point the Exif Viewer at the image you can extract all the embedded information, including both the GPS coordinates and a Google Maps view, as shown here. You can then use Google Streetview to see the, er, street view of the scene (if their little cars have visited). OK, so much for the introduction to a potential problem, why should it be of interest or relevance if you don’t post GPS-tagged images on your personal blog, Facebook page, Instagram account, internet discussion forums, Flikr, 500px etc.? The real problem isn’t the GPS-tagged images at all (I’ll describe an easy solution to this later in this post), rather it’s the resolution of the online satellite images provided by Google, Bing and others. These are good enough now to locate apiaries relatively easily and to see individual hives in certain circumstances. They’re also going to get a lot better soon. 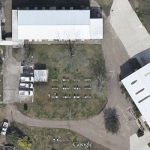 Rather than compromise an amateur beekeeper, or publicise an otherwise hidden apiary, here is an image containing three rows of hives (on rail stands) at the ARS Honeybee breeding, genetics and research labs in Baton Rouge, Louisiana, USA … I think it’s fair to say it’s no secret that they’ll have apiaries on site 😉 And below is the view from ground level, taken in a different season with the trees in full leaf. The cars in the satellite image provide a sense of scale. Google Maps (and Bing and others) satellite imagery are of similar resolution for the USA and the UK. The satellite image above is not even at maximum size … when it is you can pretty easily count individual hives. This was brought home forcefully when processing a smartphone image (with embedded GPS coordinates) in Adobe Lightroom. 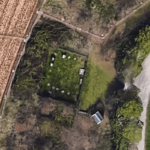 The Map module showed a neat row of hives in the corner of a field. Google updates the images they use reasonably frequently, so even if your colonies are not visible now they might be soon after the next satellite passes over. were located under light tree cover. This would seem to be both practical and relatively easy to achieve. As long as they are not in deep shade it can also make for a much more pleasant inspection experience on a sweltering hot day, and the trees or hedges can provide shelter from strong winds. contained only individual hives. Whilst absence of evidence isn’t evidence of absence it is certainly easier to detect neat rows of hives along field boundaries or angled across the corner of a meadow. The most obvious hives were those in which the roof contrasted with the ground. This was particularly marked with bright, shiny, metal roofs glinting in the sun. Older, tattier, hives or those with roofs covered in roofing felt were more difficult to find. Perhaps it might be worth applying camouflage paint to new hive roofs. Irregularly placed hives in dark or muted colours that didn’t contrast with the ground were generally tricky to see. None of these precautions are foolproof. None of them negate the need to keep your colonies in secure, private locations, preferably behind locked gates. However, they might be useful in preventing unwanted attention. But what about my online images? Some image hosting sites automagically strip location-sensitive information from uploaded images. Others do not. On the principle that it’s better to be safe than sorry it’s worth always ensuring the uploaded images do not contain this information. Phones usually have an option to exclude GPS data from images. Alternatively (and to avoid omitting the location information from all the images you want to keep it in) it’s easy to strip unwanted exif data, including all the GPS data, using software. If you’re an Adobe Lightroom user this is an option under the ‘export’ menu. Alternatively, ImageOptim is an excellent (and free) Mac application that compresses images, strips out unnecessary metadata including all the location information and removes unnecessary colour profiles. This typically reduces the file size by 10-20% and works with a range of graphics format images. The image per se is unaltered. It runs as a Service on the Mac, which makes it even easier to use. There are also ways of removing exif data from your images if you use Windows. I’ve not used these and cannot comment on how well they work. This entry was posted in Beekeeping, Security and tagged apiary, Google, hive, roof, satellite, security on October 9, 2014 by David.